If you’re looking for Valentine’s Gifts for the special man in your life, we know how tough it can be to pick the perfect present. But we also know that it doesn’t have to be such a challenge. From executive accessories to gadgets and hot 2018 fashion items, Zalando Lounge will help take the stress out of Valentine’s ideas for him, so let’s dive into some of this year’s hottest gifts – we’ll help you make the 14th February more romantic than ever. First off, why not think about giving him a fresh new pair of shoes to help renovate his spring footwear collection? Guys often take the opportunity to rejig their wardrobes when spring arrives, and your partner will be delighted by a well-chosen pair that fits his personal taste. Whether you go for a pair of burgundy leather boots from brands like Emerson, some dazzling brogues from Floris van Bommel with crocodile skin-style uppers, or a pair of designer trainers, footwear always goes down well. Just remember to check his size and try to discover the width of his feet too. When you’re buying smart shoes, picking wide or narrow fits can make a really big difference on how comfortable they feel. Of course, footwear isn’t the only romantic gift on offer. Timepieces are also classic Valentine’s ideas for him. If your partner’s watch is looking ragged around the strap or doesn’t have advanced features like activity tracking or an SMS message display, Valentine’s Day is the time to put that right. Have a look at the classic chronograph watches from labels like Thomas Sabo or Police, or the retro-styled leather-strapped varieties from Kiomi and Fossil. And check out smart watches as well. Nowadays, it’s easy to find watches which mix good looks and advanced tech – both things that guys tend to love. Another romantic idea when finding Valentine’s ideas for him is to buy a range of smaller accessories instead of going for one larger item. If you choose to go down this route, give your creativity free reign and search for items that will enhance your partner’s wardrobe and style. For instance, if he’s into jewellery, he will probably appreciate bracelets, rings or necklaces – but don’t forget belts and cuff links. Belts with creative buckle designs and designer cuff links can harmonise really well with beautiful men’s jewellery, allowing him to wear them as part of an ensemble – whether it’s for work, weddings or just evenings out. Finally, men’s fashion in general is always a good area to hunt for Valentines ideas for him. If his workwear collection is getting a little stale, or he’s running short of shirts without food stains, you can always buy a few new designs to set that right. 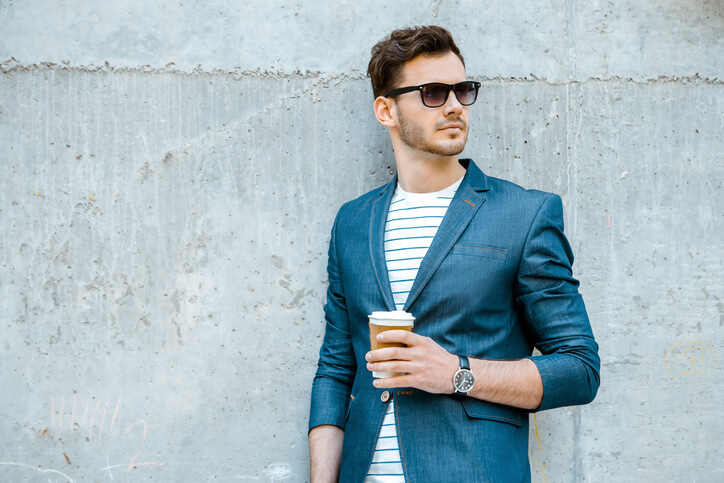 Blazers and smart-casual jackets also tend to go down well, as they can be mixed and matched with suits and jeans for all sorts of occasions. And, as the weather starts to warm up a bit, stylish light jackets will come into their own. So a lightly padded jacket from Hackett, or one of the summer jackets from Homme, Tigha or Ralph Lauren could do just fine. Whatever you choose, it makes sense to shop somewhere with the widest selection and the best possible prices. When you join Zalando Lounge, you’ll gain access to regular flash sales of men’s fashion and accessories, with hundreds of Valentine’s Ideas for him coming online all the time. Create an account, browse around and you’re sure to find the perfect gift.